The following story raises some interesting questions about patriotism but some other questions too. The answers have to be approached with the mindset of someone living around the time of the First World War and not by applying today’s thinking. Afterwards make comparisons with today’ s thinking. The story is fixed in time at Thursday May 6th 1915 – more of that later. They are the six sons and one son-in-law of Mr. John and Mrs. Catherine Fraser, my great grandparents. Mr. and Mrs. Fraser were married in Devonport in June 1876. Mr. Fraser, or rather Corporal Fraser, was a regular soldier with the Royal Scots based in barracks in Devonport. He remained in the army until around 1893 when he retired as Colour Sergeant. He and his wife, who came from Pembroke in South Wales, moved to the small coal mining village of Bonnyrigg, 8 miles south of Edinburgh where Mr. Fraser worked as a timekeeper in a paper mill. In all they had 12 children- 7 boys and five girls between 1877 and 25th November 1899 (remember this date). Two of the children, a boy and a girl, died aged 9 months and 3 years. By the time of the story, Mr. Fraser was dead-he died in 1910- and Mrs. Fraser was a widow with six adult sons, one of whom was her youngest child. Her oldest daughter was married to a Mr. Robertson. Mrs. Fraser also brought up two of her granddaughters neither of whom was yet born at the time of the story. One was called Ann Fraser – she later became Ann McEwan, my mother. In October 2007 I was attending my mother, Ann McEwan’s funeral. She died on 6th October 2007, aged 89. When the cortege reached the cemetery in Cockpen, Bonnyrigg, an elderly man in his nineties already stood at the graveside. He was supporting himself on a white stick and he gave way to let the main party through. He stood behind the other mourners until after the funeral when he was recognised as John Fraser the last remaining male descendent of the Fraser family and cousin of Ann, the deceased. At the “funeral tea” he produced some sepia photographs and what looked like a cutting from a newspaper which contained nine photographs (what we would call today passport size photos) of Mr. and Mrs. Fraser and their six sons and one son-in-law. 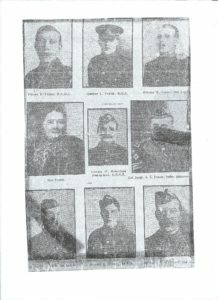 All the men in the newspaper cutting, including Mr. Fraser, wore military uniforms. John Fraser knew nothing of the cutting other than it contained the photographs of his grandparents, six uncles and his father, David. He had found the cutting amongst his father’ s possessions when he died. He gave it to me and I undertook to research its origins. The cutting if it was one, showed only the nine photographs with the names of each person underneath and, in the case of the men, their regiments. There was no header or footer. I had recently retired. My father had kept a detailed family tree and had written a book about his life – so much was known of the McEwan’s – but what of the Frasers, my mother Ann’s family? As a young man, like many young people I had heard the family stories but had only half listened as I was too busy living my own life in the present- a fact that I deeply regret today as there are few around now who could repeat these stories. I knew my great uncles had fought in the First World War as I had met and been brought up with them. I also knew that they were not regular soldiers so the photographs would have been taken some time during the period 1914 to 1918. I reasoned that as the family had lived locally in Bonnyrigg, if this was a press cutting, it must have been in the local newspaper. I went to the county library of Midlothian where copies of the local paper are kept on microfilm. I searched these but found nothing. What did become clear was that there were few photographs in the local newspaper at that time. This also proved to be the case when I widened the search in the National Library where copies of newspapers both local to the Edinburgh area and the national newspapers are kept. Having been a paper boy myself I knew there were no local Edinburgh daily papers but that there were two local Edinburgh evening papers – the Edinburgh Evening News and The Evening Dispatch. Back copies of these I started searching – laboriously. I focussed on those from 1914 to 1918. These contained few photographs, the typescript was small and stories were written in formal English. Many of the stories from 1916 to 1918 concerned reports of Hearings about men claiming to be under age or advancing arguments that they should not be conscripted into the forces as they were needed at home. Few of these hearings resulted in men being given exemption and many contained the exact words delivered by the person presiding, often calling the applicants “cowards” and their witnesses – usually their parents – “unpatriotic”. The mood of the newspapers in 1914 and early 1915 was jingoistic, calling the country to war. When the day by day newspaper search arrived at page 6 of the copy of the Evening Dispatch of Thursday May 6th 1915, the nine pictures jumped out of the page. It was a newspaper cutting! “Splendid Example of Scottish Patriotism”. “Six sons and one son–in–law in the army is the record of which Mrs. Fraser, Camp View, Bonnyrigg is justly proud and His Majesty the King has also expressed his appreciation of such patriotism. The Keeper of the Privy Purse in a letter to Mrs. Fraser, says: -“The King was much gratified to hear of the manner in which they have so readily responded to the call of their Sovereign and country, and I am to express to you and to them His Majesty’s congratulations on having contributed in so full a measure to the great cause for which all the people of the British Empire are so bravely fighting.” Colour Sergeant J. C. Fraser (father) served for twenty-four years in the Army, eleven of which were spent in India”. The newspaper article gave rise to a number of questions most of which will never be fully answered. Let’ s start with one that is answerable. How old was Private G. (George) Fraser on May 6th 1915? He was the youngest child of the Frasers and according to the family bible was born on 25th November 1899. That being so he was 15 – six months short of his 16th birthday and too young to join the army – the minimum age for a recruit being 18. That being so, his brother Len – Gunner L. Fraser – who was born on 29th October 1897 was 17 – five months short of his 18th birthday when the article appeared in the Evening Dispatch. Moreover, all of the men were in full uniform and had not been recruited that day – they had been in the army for some time before. Just how long is not known. So how young were George and Len when they joined up? Did their mother know they were in the army? It is unlikely that she did not, as they were certainly not at home and would have been missed. Moreover, she must have been approached before the article appeared – at the very least to provide the newspaper with her photograph and that of her late husband. It is unlikely that the army would have kept photographs of all recruits as they now do, so it is probable that she had given the Evening Dispatch all the photographs. These in turn would most likely have been given to her by her proud sons when they had had them taken of themselves. There can be no doubt that she was proud of her sons and coming from an army family – her husband and his father before him were regular soldiers – she would have been proud that they volunteered. (Conscription did not start until 1916). But why would she agree to her younger sons joining up underage or do nothing to stop them? This we will never know. Was this her patriotism and was this common amongst others at that time? Another question is how did this story come to the notice of the press in the first place? Did it originate from the military at a time when volunteering was drying up or did it come from the family? Ordinary people rarely appeared in the newspapers, the only form of media available at that time – a time before celebrities. Was Mrs. Fraser one of the first media attention seekers? Highly unlikely as she could neither read nor write. Her marriage certificate bears “the mark of Catherine Bevans” (her maiden name). So how was this working class family, living in a fairly remote Scottish village, known to the media? And why did they go to all the trouble and expense of obtaining and printing all their photographs in an unusual single block? It is most unlikely that Mrs. Fraser herself initiated contact with the King as some people do today. That the matter came to the attention of the Keeper of the Privy Purse may answer in part the question as to the purpose of this article – a bit of propaganda designed to encourage others to be “patriotic”. But it still does not answer the question why the Frasers? They were a big family by today’s standards but not those of the time. Large families were the norm then. So why did they stand out? Whatever the answer to these questions, Mrs. Catherine Fraser was a truly remarkable woman. No surviving family member had ever heard of a letter being received by Catherine Fraser from the King. All of her sons and her son-in-law survived the war although two were believed to have been wounded whilst John Fraser’s father, Dave who was in the Royal Army Medical Corps and tended the wounded in the field, was gassed and was disabled all his life. They all served at the front. George was discovered to be underage and was discharged from the army. He rejoined when he turned 18 in late 1917. I later discovered from George’s daughter that he had enlisted as his brother Len’s twin as they looked alike and were the same size! In the late 1800’s, railways had been built in Midlothian to transport coal, paper and carpets to Edinburgh, Leith and beyond. Passenger services were started and along the rail routes businessmen and professionals built houses allowing them to move out of the city and to commute to work in Edinburgh. Groups of large houses were built in places like Polton, Lasswade, Broomieknowe and Eskbank. Some of these people became stalwarts in the local churches. My grandmother and her children were all regular church goers and members of St Leonard’s Episcopal Church, Lasswade. It is certain that “the toffs” of the time at St Leonard’s would have known the Fraser family and it is possible that one of them initiated the press contact with my grandmother.